It’s not the most glamorous of words to associate with rock ‘n’ roll, but it’s an entirely appropriate one for a medium that chews up and spits out performers in the blink of an eye. As such the musical images the word “survival” conjures up to people takes on many guises. Picture a few aging members of a doo wop group decked out in red-sequined tuxedos singing their old songs at third rate casinos augmented by two younger vocalists who hadn’t been born when those songs were hits back in the 1950’s. Or imagine reading about the leader of a long forgotten 60’s garage band that managed to score a minor hit before falling off the face of the earth. The story then recounts how after bouncing around for years doing odd jobs and eventually going back to school to try and learn computers or air conditioner repair to make ends meet he stumbles into the world of advertising and carves out a living with his ability to write and/or sing commercial jingles. Or maybe you came across a vacation website advertising a seventies disco act who couldn’t even get a phone call returned once disco crashed by the mid-80’s, then after repudiating any association with that era and still finding no takers they became embittered and went years without even thinking of music before finally coming to grips with their past upon which they found steady work by taking gigs on cruise ships where they sing those hits to enthusiastic old timers who can no longer dance since undergoing their last hip replacement surgery but still want to relive their decedent younger days in their minds. For many that’s the all too real world of musical survival. Not glamorous, nothing to make you rich and a long way from any semblance of fame, and maybe if you’re cynical about such things it’s hardly anything to really be proud of either, but for those who chased that dream of stardom in rock ‘n’ roll from the time they were kids and managed to ever so briefly find a moment or two of glory along the way before it evaporated as times changed, the allure of making music for a living is too strong to fully let die. Besides, it’s better than collecting unemployment checks or selling time shares for Florida condominiums. Of course when you’re making (or listening) to music as it is being released in the present, whenever that present was, you never think of these eventualities. Music at its best is meant to be heard “in the moment”, one reason we here at Spontaneous Lunacy are constantly preaching context! The need to understand the era and culture it came from and to judge the music that it spawned accordingly. But when the record stops spinning the artists don’t stop living. There’s another song to cut, another concert to play, another hit to chase and another record deal to try and secure. But the fact of the matter is most performers don’t last very long. We celebrate those who do, artists like Ray Charles who was winning Grammy Awards nearly sixty years after he first recorded, or The Rolling Stones who continued to reap tens of millions of dollars for world tours a half century after they began. But they’re the exceptions to a tried and true rule which states pretty unequivocally that your window of opportunity is measured in minutes rather than decades and in the big scheme of things that brief moment of glory earned by a single song is only a small drop in the very large bucket of life. What does the rest of that bucket hold when looking back besides blood, sweat and tears? So survival, as unpleasant as it is to contemplate when meeting an artist for the first time with all of their dreams still intact, is more often than not going to be their reality when that song is over and we move on to the next artist, the next review, and soon head into next year and eventually the year after that and we leave them behind. The names we’re coming across today in the last days of 1948 won’t all be around by the first days of 1950, let alone 1960 and beyond. For those artists who were just momentary figures on a rapidly moving scene which they never quite conquered their most pressing concern by that point won’t be trying to score another hit, but merely trying to survive professionally… in whatever way possible. Tina Dixon is the perfect example of a musical survivor. Never a star, but she never quit trying. Dixon managed to have a long, if not entirely profitable career in music. She was singing in clubs at 14 and was still doing the same well over four decades later, which means she must’ve been doing something right all of those years, regardless of the lack of commercial success she had for most of that time. 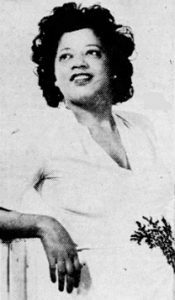 She was first discovered in Detroit at Club Ballyhoo by bandleader Jimmie Lunceford in 1942, which should give you some idea about her potential. For those not in the know Lunceford, not Benny Goodman who was merely more heavily publicized by the white media at the time, was the REAL King Of Swing, featuring a band second to none in their well-drilled showmanship and tight inventive arrangements. Like all big bands of the day whoever was hired as vocalist, and there were usually multiple men and/or women at any one time, were simply a (small) part of the larger ensemble and Dixon was no different in that regard. Though she toured with them from 1943-1945 she didn’t appear with him on any commercial recordings, not even for her signature song, “E-Bob-O-Le-Bob”, though she DID make a record of that with Lunceford to be played on the Armed Services Radio Network for soldiers overseas (a common occurrence during the war when artists routinely cut V-discs for such purposes). Shortly after leaving Lunceford’s group she recorded the song with The Flennoy Trio in 1945 but by that time Helen Humes had scored with the song in what is considered the definitive recording of the tune. In fact it was one of the most frequently recut, refashioned and reconnoitered songs of the era, something done under countless similar titles by just about every artist under the sun in the mid-40’s. Dixon was the one who was granted credit for introducing it however (way back in 1942), which should have secured her future legacy – not to mention her financial security through its writing credits alone, which she didn’t get a dime for of course – but we know that wasn’t to be. Yet she was drawing some acclaim for it at the very least and in the mid-1940’s she must’ve felt like she was on top of the world. By this time she had married Leon Collins who, thanks in part to her connections, became a highly respected jazz tap dancer and was among those in that medium who first embraced bop, yet he also danced to classical music before the tap dancing niche in nightclubs dried up after the war. For awhile though they were a royal couple, maybe royalty from a small country, but still afforded a good deal of respect from their community. But it was a world undergoing drastic changes following the war years and the aftermath of the first Petrillo recording ban (1942-1944) the combined effects of which essentially killed off the reign of the big band era. On July 12th 1947 Lunceford was murdered by racist white restaurateurs in Oregon who – offended they had to serve blacks, especially those who were defiantly asserting their rights to eat there – fed them rancid hamburgers, the only thing they claimed to have for them. The band all became violently ill – save the one member who didn’t eat – and Lunceford died on the way to the hospital, just 46 years old. The swing era in black music was buried with him. The following week Roy Brown recorded Good Rocking Tonight and launched the next musical revolution called rock ‘n’ roll, which – a year later – is where we meet Tina Dixon, a singer by now in her late 20’s, maybe early 30’s, her one real shot at lasting glory already in the rear view mirror, but still a long way from throwing in the towel on her career. Despite the rather unlikely and frankly dubious pairing of transient artist desperately looking for a lifeline and an emerging musical movement growing stronger by the day and with no need for charity cases, something that has all the makings of a badly judged train wreck, the match is reasonably effective, if not exactly properly executed. As probably can be discerned from the title Walk That Walk, Daddy-O has at least one eye on the pre-existing transitional style that came before rock ‘n’ roll. The massed horns that kick it off are the first giveaway and the string bass solo is a typically jazzy touch. Yet it’s still forward moving for the most part, not backwards glancing, and following a slinky line Dixon comes in full of enthusiasm and you’re willing to give her the benefit of the doubt going forward. The horns really set themselves apart here. They’re playing a hybrid type of sound we haven’t encountered in rock to date, but it’s certainly not strict jazz by any means. There’s a snake-charmer aspect to the first solo that’s very captivating and while far less ribald than most of the sax solos rock has featured it still manages to sound subversively urgent. Dixon’s voice isn’t lacking in strength and has decent enough command, though she sounds rushed at times, playing catch-up to the band rather than leading them at her own pace, but she’s holding her own. Though her voice is appealing in a way it’s also evident that she didn’t have what it takes to be a star in any music field, her talents were essentially run-of-the-mill. She certainly is better than most aspiring singers, possessing a brash confidence that helps to sell her wares, but what sets apart the merely decent professionals from the transformative stars – the perfectly judged feel for a song, knowing exactly how much pressure to apply, when to pull back and when to pour it on – is simply out of her reach. She remains beholden to the surface attributes of the song itself and while she delivers it competently she isn’t able to add anything of herself to it outside of an ad-libbed cry – Awww, Get it – leading into a far-too jazzy trumpet-led break that holds it back even further. The lyrics are a dime-a-dozen too, which certainly doesn’t help elevate this past merely serviceable status. The “Daddy-O” aspect of it, an attempt to connect with probably a slightly older, more citified dandy than most of rock bothered courting, undercuts its effectiveness as a pure rocker, but aside from that slang which unquestionably dates it, both in terms of era and setting, it doesn’t really make any drastic missteps along the way. There’s nothing great about it but there’s nothing glaringly wrong with it either. The problem is it’s just not aspiring to much. The closing – following the admittedly ill-advised quasi be-boppish instrumental passage – showcases Dixon at her most unbridled and gives some indication as to why she remained a fixture in clubs for so long, even without the successful recording career to get her out of the lower end dives and earn her a place on the bigger revues once her time with Lunceford ended. It also hints at ways in which this record could’ve been improved upon by emphasizing that aspect of her persona even more, but alas she wouldn’t get another chance to work it out. Regardless of what she thought of all this – the musical motif she was entering, the rougher hewn King Records label she was now recording for, and the song itself for that matter which she penned, but perhaps didn’t envision being cut in quite this fashion – she’s fully committed to selling this, and herself in the process. While the record may have only 50% of what is required to make it appealing to the audience they’re aiming for, she is bound and determined to add the other 50% herself through sheer sweat fueled effort alone, and in the end you have to admire her for that, even if she falls short of her goals. Of course we know this wasn’t going to result in a hit of any kind and turn her career around and I’m sure she knew it too. In fact, as serviceable as it is Walk That Walk, Daddy-O wasn’t going to stave off her slide into obscurity either. As a rock record at the tail end of 1948, the year in which the music came into its own and firmly established itself with a growing audience, this was decidedly forgettable. By this point it would be a stretch to even call it average in comparison to what the rest of rock was doing at the time, and while you’d probably let yourself enjoy it in passing you’d never seek it out, nor would you probably even bother checking the label if you heard it on the jukebox to see who was singing it to keep the name in mind to look for in the future. So, not surprisingly, Tina Dixon saw little or no residual effects from this. But that’s not to say it’s worthless, or to even to say it was a bad idea and that Dixon would’ve been better off focusing her attention elsewhere. For her at the time there WAS no elsewhere, at least none more inviting than what rock ‘n’ roll offered. Though it wound up not being the right match for her in this instance the chemistry she needed to make something connect in this field wasn’t as far off as might otherwise be assumed. A few tweaks, a more muscular arrangement and a more brash delivery and who knows what she may have been capable of delivering to make her mark, however fleeting, in rock ‘n’ roll at that time. As blind dates between artist and musical styles go this pairing certainly didn’t result in a marriage, a torrid romance or even a second date, but it wasn’t a bad night on the town all things considered. For a girl just trying to survive in the musical jungle this at least gave her a warm meal and a few smiles before heading down the road. Dixon WOULD survive, though hardly in the way she – or anyone else for that matter at the time – probably could’ve expected. She continued on the club circuit, the venues getting smaller, the pay smaller still, but the connections she forged on those long trips to and from nowhere did her well in the long run. Befriending comedian Redd Foxx who was gaining underground notoriety in the 1950’s with a series of off-color party records which moved a lot of copies when sold under the counter, Dixon headed into that realm herself and in the 1970’s released two racy, downright dirty albums as Auntie Tina Dixon, even making a few appearances on Foxx’s hit TV series Sanford & Son. It was a long way from Jimmie Lunceford, maybe a less so from the bedroom of rock ‘n’ roll, but still pretty far off. Yet it gave Dixon a second, or was it third act in her career, one that took her from the brink of stardom in the swing age to the precipice of indifference in the early days of rock before becoming a queen in a low-rent district of comedy. But even a queen in a small country still wears a crown of some sort and considering the road she took to get there, for a survivor like Tina Dixon she must’ve at least worn it with some pride. Leave a reply on "Tina Dixon: “Walk That Walk, Daddy-O”"